According to The Conference Board Job Satisfaction survey from 2016, 49.6 percent of Americans are content with their job. Even though this is the highest overall job satisfaction rate since 2005, there is still room for improvement. A variety of factors can turn your place of employment into a living nightmare; stress from being overworked, not feeling appreciated by your boss, a tiff with your coworkers, etc. However, it is important to remember there’s always something you can do about it! Jacob Morgan, author of The Future of Work and contributing writer for Inc.com shared three insightful tips. “Pull together your complaints and issues and bring them to your manager or coworkers in a thoughtful and respectful manner,” Morgan stated. Make sure you are not complaining or blaming during this conversation, and instead offer solutions on how to fix the problem. For example, you could suggest another project you would be better suited for, or explain what type of guidance you would need to excel at the task you have been assigned. “You do not necessarily have to be best friends with your peers, but if the environment in your department is hurting your career, it could be best to move to another area,” Morgan shared. Workplace unhappiness commonly stems from a lack of chemistry or cohesiveness with your coworkers and/or manager. According to Morgan, the number one reason for leaving a position is not getting along with your boss. Instead of quitting all together, another option is moving to a different department. Bigger companies especially would much rather move you to somewhere you would be more comfortable than take the time to hire another person. Ask around to see where you would be a better fit, and then propose the idea to your manager. Let them know that a change of pace with new officemates would make you more satisfied. “If things in your office are so bad they can’t be repaired, it could be time to move on,” Morgan said. You spend the majority of your life at your job, so it should be enjoyable. According to Morgan, a growing number of people have been leaving behind their unfulfilling jobs and are finding a light at the end of the tunnel. However, it is best to have something else in the wings or at least be on the hunt before giving your two week notice. Morgan stressed to be classy with your departure, and to not burn bridges, regardless of your frustrations. Whether you love your job or not, there will always be ups and downs. Leo Carver, contributing writer for chopra.com, shared some mindful ways to deal with constant change. When you are up to your eyeballs in assignments, you may skip your daily walk, or binge on sugary drinks to keep up the stamina. It is easy to take up these bad habits for a temporary gain, but your body and mind will suffer in the long run. 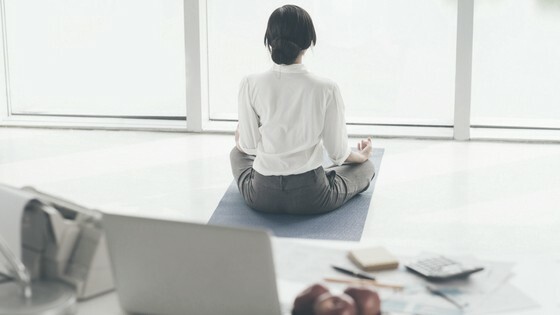 According to Carver, making time to meditate, do yoga, and most importantly, love yourself, will not only make you happier, but will also help you focus on the tasks at hand; a win-win! When you find yourself fuming about an encounter with a coworker, or leaving work feeling unappreciated, ask yourself why. Take the time to check in with your emotions and figure out what’s really bothering you. Carver said to remember that you are the most important. This may sound selfish, but if you are not taking care of yourself and functioning at your highest level, how are you supposed to do your job efficiently and aid those around you? It all comes full circle, which is why taking care of yourself can actually be seen as selfless. “Problems have a purpose; when you experience and dissolve a problem it can cause a stirring in your being,” Carver shared. When someone at work is venting to you about an issue, simply listening intently and offering to help can quickly turn the situation around. Moods are contagious; by being compassionate and helpful toward your coworkers, they in turn will want to do the same for you and for others. “When you have a centered, self-focused reality, the everyday chaos of your job will seem less significant,” Carver shared. Whether you are working this particular job to get out of debt, buy a house, or become more educated, remind yourself of that goal throughout the day. You are here on this planet to live your life and fulfill your purpose. No matter how tough it gets, realizing this will keep everything in perspective and allow you to make the most of the situation. Being alone, even for a few minutes, can help ground you, especially if you are able to get some fresh air during that time. According to Carver, a short series of deep, complete nostril breaths can relieve stress as well. Some peace and quiet should allow you enough energy to take on the rest of the day’s workload.